Nectar-producing flowers alone can attract butterflies into your yard, but if you want to be sure these gorgeous creatures visit regularly, it takes a bit of strategic planning. The key is to understand which plants each species prefers and plan for each of the butterfly’s four life stages: egg, larva (caterpillar), pupa (chrysalis), and adult. Tracking cycle of a butterfly is another easy opportunity to get kids interested in gardening. Though some species of butterflies can be seen year round in San Diego, the peak season is between February and November depending on the weather. According to Master Gardeners of San Diego, butterflies are most likely to be seen on windless days when the temperatures range between 65-95°F. A list of all species of butterflies known to live in or visit San Diego was compiled by the San Diego Natural History Museum. It is surprisingly long, featuring endangered and protected species, but species you may see in the garden include Monarch, swallowtails. buckeyes, mourning cloaks and more. Butterflies require two types of plants: host plants and nectar plants. Both can and should be planted together in any garden. Butterflies lay eggs on host plants. 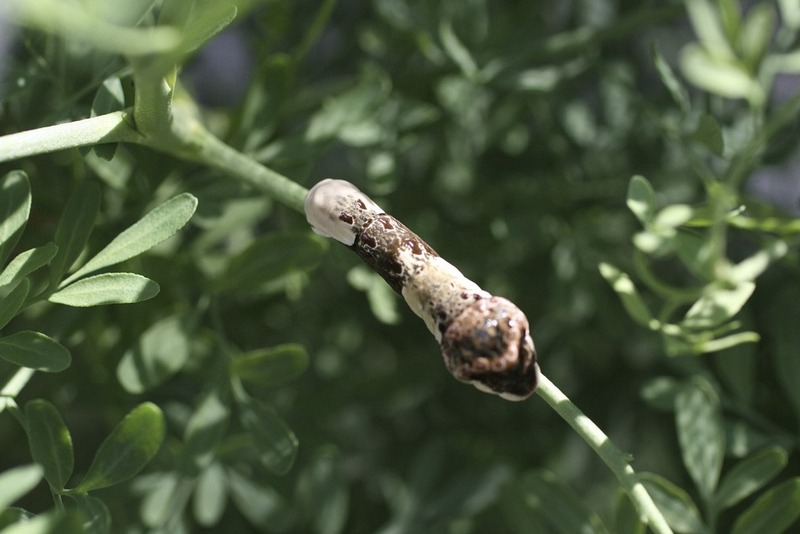 When the eggs hatch into caterpillars, the host plants provide the tasty food caterpillars need to survive. 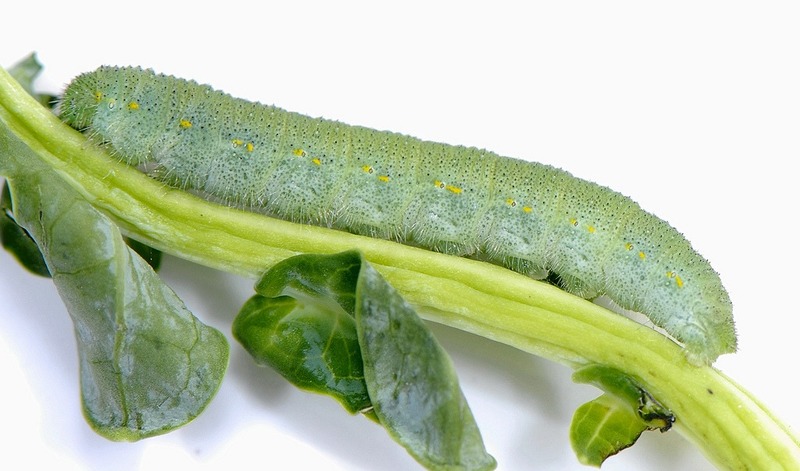 Most gardeners believe that these caterpillars don’t do significant damage to host plants—if you’re worried about that—with the exception of cabbage butterfly larvae (pictured below). They tend to munch heavily on vegetables such as cabbages and lettuce. Just pick them off. Eventually, the caterpillars will disappear in order to spin their chrysalis, which one might find underneath leaves or in nearby piles of leaves, rocks, or wood. They prefer protection and camoflauge so perhaps it’s an excuse not to tidy up if you notice the caterpillars aren’t visible anymore. After the butterflies hatch, they set off in search of a nectar plant. Butterflies tend to prefer nectar plants with flowers that are colored white, yellow, orange, red or lavender. The flowers should be relatively open with shallow throats, making it easy for butterflies to access and drink nectar. If you’re looking for another reason to boycott genetically-modified food, this one relates to Monarch butterflies. They are specialist feeders, which means their caterpillars like to eat only one species of plant: milkweed. There is an interesting reason why this is. Milkweed contains toxic steroids, known as cardenolides, which are bitter-tasting. Caterpillars can handle the toxins but they remain in the butterfly after metamorphosis. The Monarch’s predators find the taste unpleasant and often spit out the butterfly whole, sometimes saving its life. Back to GMOs… the pesticides used to treat genetically-modified corn and tomatoes kills milkweed, normally a common presence in agricultural fields. Scientists believe the loss of milkweed due to GMOs is so massive that it’s a threat to the Monarch butterflies migration patterns. Remember, we need these butterflies to cross pollinate other plants and crops! 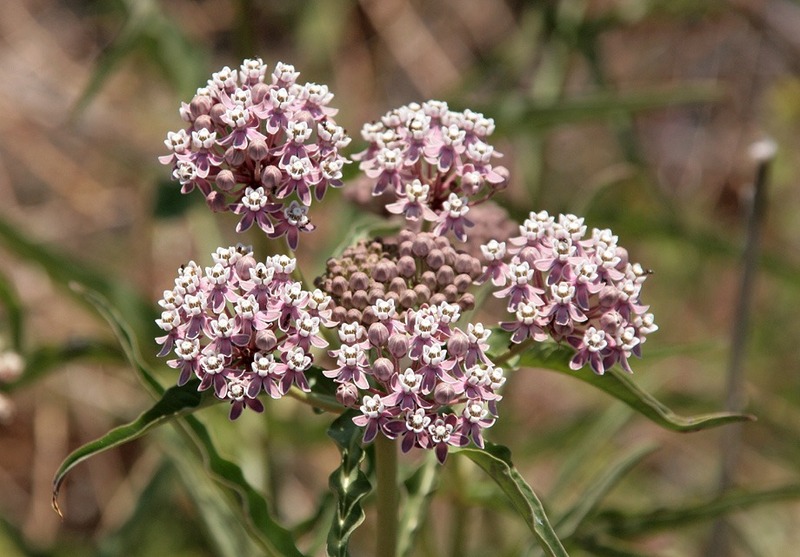 Fifteen species of milkweed are native to California and Monarch butterflies love them all. 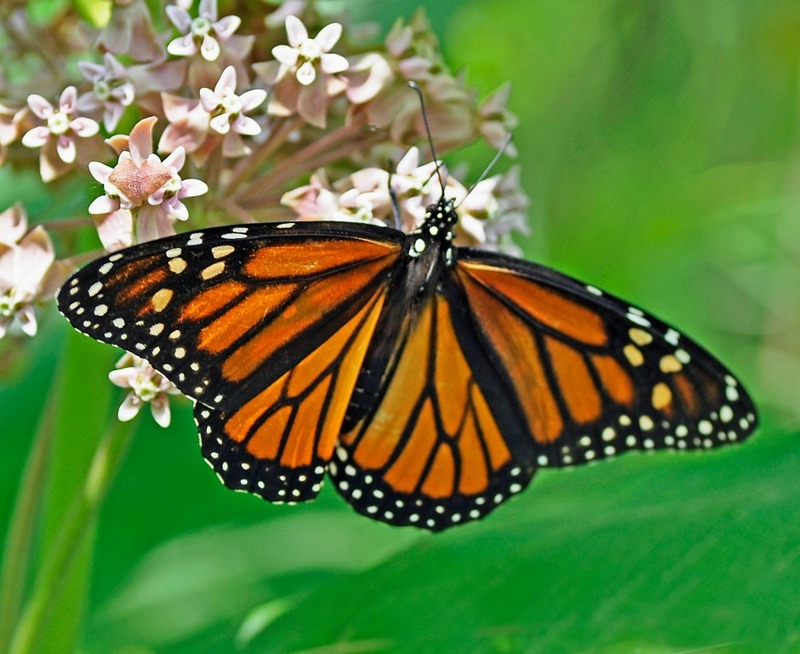 However, you’ll want to plant the same milkweed that grows naturally along the butterfly’s flyway in order to ensure that their bodies are protected with the cardenolides. California natives—which you may need to source from a native plant nursery—tend to go dormant in the winter and this cyclical event prompts Monarch butterflies to migrate to where milkweed is blooming. 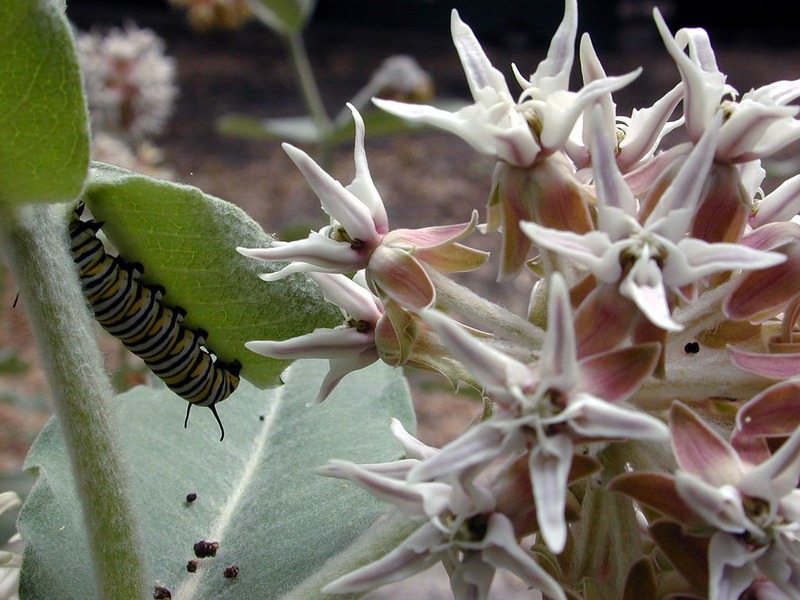 However, some scientists believe that the presence of gorgeous milkweeds that bloom year round—such as the South American milkweed, not native to California—cause Monarchs to linger when they shouldn’t. Milkweed is pretty though and we’re not going to lie—South American milkweed is stunning with bright red, orange and yellow colors. If you’re at all concerned about the plight of the Monarch, consider these two alternatives that are native to California. This is perhaps the most beautiful of the milkweed options with big mauve flowers and velvet leaves. Note the Monarch caterpillar in the photo above. Monarch butterflies actually prefer this plant, though it’s not quite as showy as, well, the showy milkweed. Adult Monarch butterflies scratch the leaves with their front legs and tastes the plant with their feet to confirm it’s milkweed. Milkweed also feeds caterpillars from a number of other species, too. Herbs and butterflies share a common need of sunshine (they rely on the sun to warm their muscles for flight) and open space. Common herbs such as mint, dill, fennel, chives and anise provide both food for caterpillars and nectar for butterflies when the herbs flower. Butterflies love fennel but consider growing it on its own in a pot. 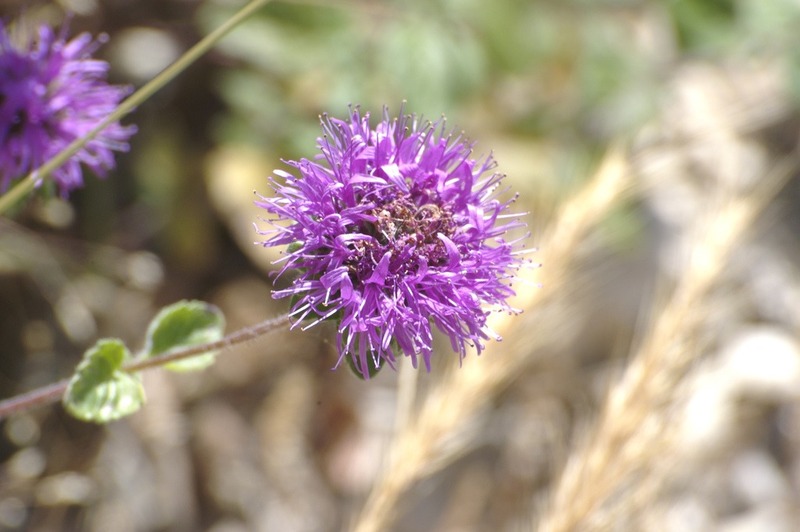 It’s actually an invasive weed that can cross-pollinate with plants like dill and is seen growing in the wild on hillsides all over San Diego. Plant herbs in combination with milkweed and the odds of attracting butterflies into the yard will increase. Giant Swallowtail butterflies, the largest in the United States with wing spans from 4-6″ wide, gravitate toward citrus trees. Some homeowners mistake their larvae for bird droppings so look closely before you do the same. An example is shown above. With their pretty blue or white flowers, ceanothus are great choices for butterfly gardens because they serve as host and nectar plants for a variety of local butterflies and moths. When considering ceanothus, double-check its growing habits. Some function as ground covers (which are excellent for preventing erosion) while other can grow quite tall. 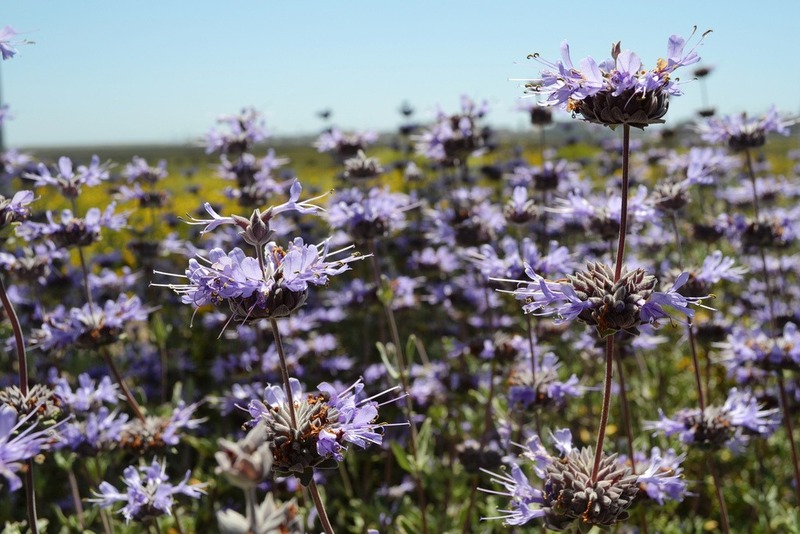 Native to the California coastal chaparral and woodlands ecoregion (which includes parts of San Diego), Coyote Mint is considered a magnet for butterflies. It’s a wildflower with leaves that smell like toothpaste and nectar-rich flowers. Considered a must-have for a butterfly garden, there are a number of salvias that are native to California. Butterflies and birds are attracted to their bright flowers, which are the perfect length and shape to suit nectar-drinking butterflies. Consider Autumn Sage (S. greggii), Musk Sage (Salvia clevelandii) and a hybrid called Salvia Pozo Blue. Caterpillars tent to grub these plants from the bottom up, so it’s wise to surround host plants with other low-growing native shrubs to camoflauge any bare branches. Also, plant these plants in an exposed manner so butterflies can spot them from above. Avoid toxic pesticides and go organic to avoid feeding the butterflies anything that isn’t natural. Make sure to plant flowers that bloom year-round or during the migratory season of the butterflies you wish to attract. The variety of plants in a yard determine whether or not butterflies visit. Which of your plants attract butterflies?